Some writers, in particular, novelists, become “italics happy.” Once they’ve discovered the slanty writing, it’s as if they’ve struck it rich. More accurately, they have stumbled on fools gold. Using italics in fiction or non-fiction is much more specialized and a lot rarer — or should be — than many know. Don’t get me wrong. 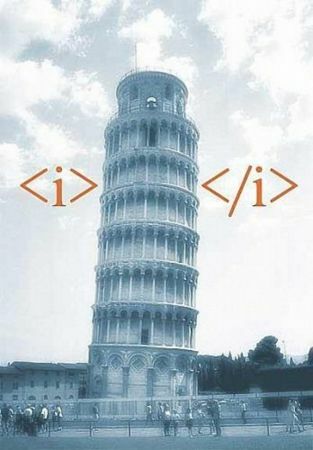 Italics do have their purposes. Here are their major legitimate uses. First, italicize a foreign word or phrase used in isolation. If an expression comes up frequently, only its first use needs to be italicized. Those close to Mikkán moved back to make room for a light-haired council member rushing forward. From a pouch at his side, he yanked out a pinch of dried leaves, then grasped Mikkán’s forearm and crushed the leaves into a powder he sprinkled over the burn. A second legitimate use of italics, more common in non-fiction, is to set off a word used as a word rather than as that which it means. In such an instance, the writer is referring to the word “president,” and not the person which such a word represents. The proper way to punctuate that sentence would be to italicize president, as I did here because I too was using the word as a word. I often mistakenly type b when I mean to type p.
Other titles that are set in italics are art works, formally titled art exhibitions, and photographs. Specific names of ships, planes, and trains (but not names of their makes, classes, or models) are also italicized. Overused, italics quickly lose their force. Seldom should as much as a sentence be italicized for emphasis and never an entire passage (7.49, 15th edition). Along this line, in non-fiction a key term may be italicized on its first occurrence to draw attention to itself. From that point on, it would be set in roman type. Fiction writers may think I’ve left off one of the most significant uses of italics: when writing interior monologue. Not so. I haven’t left it off because interior monologue, or what Chicago terms “unspoken discourse” (which would include silent prayer) does not require italics. Instead, quotation marks are used, or no identifying punctuation at all. Without looking up, Jim nodded. “Disappointed” was the G-rated version of what he was feeling, but could anyone blame him for a twinge of despair? He might never see his parents again, might not reconnect with his sister or teach his hero-worshiping nephews, Matt and Allen, his signature crossover dribble and stop-on-a-dime jump shot. There you have it. Italics ought to be rare nuggets, not flashy baubles too common to do any good. Authors, use them sparingly.